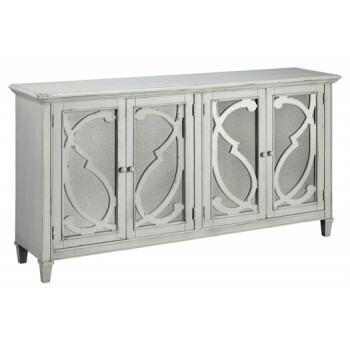 With its distressed finish made to look like fabulously faded antique white paint, this cabinet is an eclectic piece that beautifully suits so many spaces, including the dining room, living room and entryway. Ornately scrolled filigree front doors with mirrored glass inlays are a reflection of your fine taste and stylish flair. Adjustable shelving enhances its form and function.